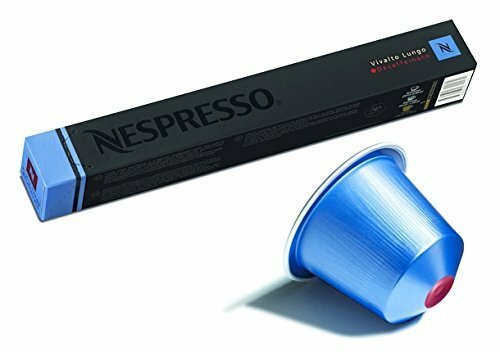 Best Nespresso Capsules 2019: So Many Pods To Choose From! Although most of our dedicated Roasty fans are keen home coffee brewers who prefer to make their beverages from scratch, there will always be a few folks out there who also enjoy the convenience and speed of home coffee making machines and capsules. Now, there are many different makes of home coffee machines that use capsules, or pods as they’re also commonly known. But perhaps one of the best-known household name amongst these is Nespresso. But with great options comes great responsibility. So we’ve put together an easy guide for picking the best Nespresso capsules for your tastes. Seriously? Okay, we’ll humor you. 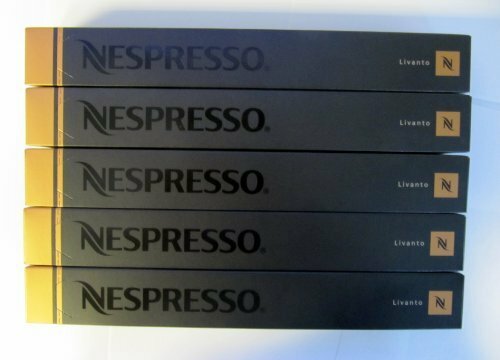 Nespresso machines and coffee consumables are made by the Swiss company, Nespresso, part of the Nestlé food group. For those who switch TV channels during the ads or head to the kitchen to make a brew, you’ll need to check out Nespresso’s most famous marketing commercial that features their “face of Nespresso,” George Clooney. Nespresso’s machines use an original, patented coffee “pod” system to produce one cup of superior-quality coffee. The machines are pretty much idiot-proof; you just load your chosen pod into the machine, hit the start button, and wait while the machine prepares and dispenses your brew for you. As the machine flushes hot water through the coffee pod, the coffee flavor is extracted from it, and the brew drains down into your cup. Before you brew, you can choose the cup size and the coffee capsule that you want to give you the flavor and the strength of brew you’re after. Also, a Nespresso machine can be used for making lattes and cappuccinos, but you’ll need to add a separate electric milk frother to your coffee-making kit and create the finished drink yourself. 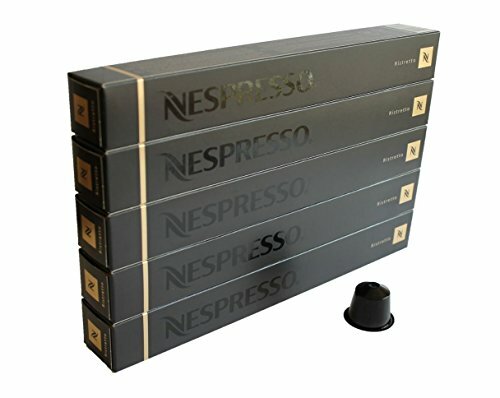 Nespresso has released lots of different varieties of coffee capsules for use with their home coffee brewing machines. Now, that can make working out the difference between them and selecting the ones you’d like best something of a challenge. But as you know, challenges are what we do best here at Roasty (as well as coffee, obviously). So, here’s our comprehensive guide to the wonderful world of Nespresso coffee pods. 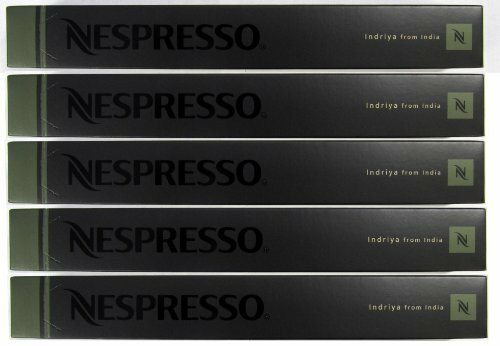 Nespresso espresso capsules contain the traditional, superior-quality coffee that most coffee fans enjoy drinking. The Espresso collection has seven pods of various strengths that carry blended coffee. Similarly, the Pure Origine pods are espressos, except the coffee contained in the three-pod collection can be tracked to a single place of origin. Lungo pods are used for making a “longer” drink. When making a lungo (or “tall” coffee), you’d use roughly double the amount of water that you would in an espresso. De-caffeinatos are Nespresso’s specialist decaff pods. There are three decaff pods in the Nespresso collection, varying by the intensity of taste they give. You can see Nespresso’s colorful pod collections illustrated in the graphic below, taken from their official website. 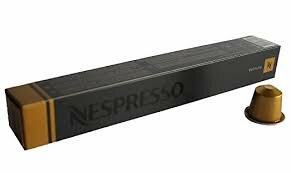 Okay, so now you’re fully appraised of the Nespresso pod collections and their qualities, let’s look more closely at what you get with each. Keep an eye out for the Volluto and Dulsão Do Brazil capsules! They´re our personal favorites. 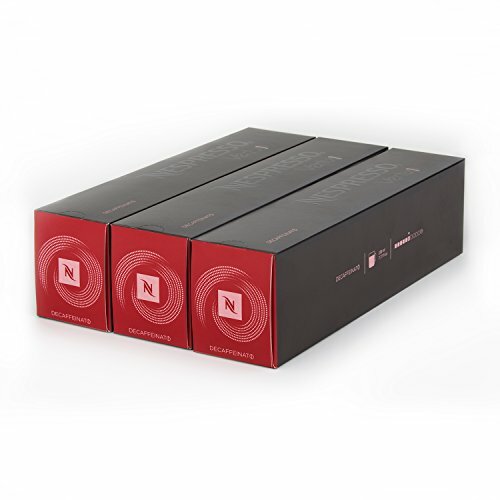 And, if you’re not sure which flavor to go for, we’d strongly recommend checking out one of Nespresso’s variety packs! Just be aware when ordering that not all the Nespresso capsules are compatible with their newer Vertuoline coffee making machines. 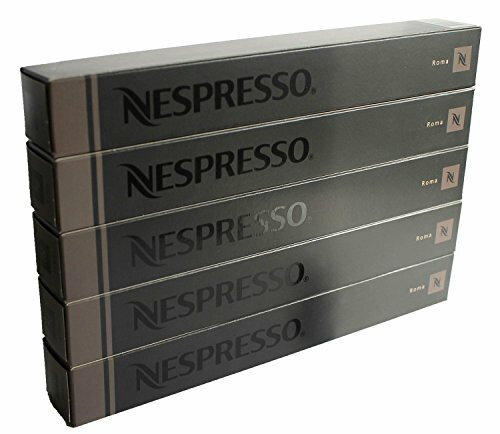 Nespresso’s espresso capsules represent the mainstay of the Nespresso array of coffee pods, as well as showcasing the company’s range of their most popular coffee blends. The seven capsules in the Espresso collection vary in intensity of flavor, thanks to the different origins of the coffee that goes into them. The Ristretto is a blend of East African and South American Arabicas. Just a small touch of Robusta is added to the blend and roasted separately to produce a subtle, fruity, slightly acidic note that perfectly complements this intense, full-bodied espresso. Additionally, the beans are slowly roasted to produce a really intense and original bouquet that’s reminiscent of chocolate. Also, the grind used for these capsules is fine to create an Italian-style brew. The Arabica coffee in Arpeggio capsules is made from a blend of Central and South American beans, with the malty, fruity profiles that are so characteristic of Costa Rican coffees. Fine grinding helps to bring out the full-bodied flavor further. As well as intensity, Arpeggio coffee has woody, almost grilled overtones, and subtle cocoa notes. Roma capsules are a balance of Central American Arabicas and Brazilian robustas that leave body and a pleasant, lingering flavor on the palate. The beans used to make Roma coffee are lightly roasted and finely ground, bringing finesse and brightness to a short, relatively mild espresso. Woody, roasted notes feature in the bouquet. The Livanto blend is made up of Costa Rican and Colombian blended coffees, cultivated traditionally to preserve its fruity, malted profile. Also, the medium roast that’s used to create Livanto accentuates the flavor and brings out a delicate, complex, almost caramelized bouquet with overtones of cereal. One of our particular favorites in Nespresso’s stable of espressos is the Volluto. Volluto is a lightly roasted, cereal-scented blend of Brazilian and Colombian Arabica coffees that are grown organically on small plantations, in line with local traditions. As far as flavor, the coffee is sweet and fruity with a distinctive biscuit, cereal nose. The Capriccio blend of South American Arabicas is grown at high altitude, giving this coffee a rich flavor and light acidity that’s balanced perfectly with Brazilian Arabica and a tiny amount of Robusta. Cereal notes predominate the flavor of this subtle blend. Cosi coffee capsules enjoy a light, citrusy character, creating a perfect light-bodied espresso that works well as a mid-morning drink, perhaps with a biscotti on the side. Cosi is made from a blend of East African Arabicas, which give it its distinctive and fragile lemony notes. Plus, sweetness and lightness are added via the inclusion of South and Central American Arabicas. Next in line on the Nespresso flavor wheel, we find Pure Origine capsules. Although this range is still considered to be espresso, the coffee that’s used to make these capsules is of single origin, rather than blended. 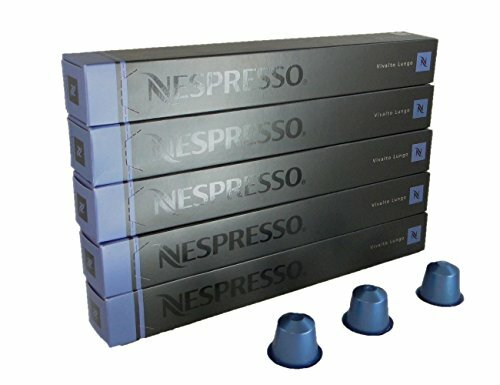 These bad boys are regarded as Nespresso’s premium coffees. The brew you can expect from Pure Origine capsules varies from very smooth and subtle, right through to extremely intense, so there’s something for pretty much every taste to be found in this collection. Red and yellow Bourbons coffee beans from the high altitude plantations of southern Brazil are used to create Dulsão Do Brazil capsules. The beans are hand-picked and sun-dried, complete with their mucilage, which adds more sweetness of flavor to the finished grind. Furthermore, the roast is crucial in the creation of this coffee. Some of the beans are lightly roasted to extract their sweetness, while the remainder undergoes a longer roast to balance the result. We love the sweet, honey-and-maple aroma of this coffee, overlaying a base of malted biscuit and cereal. The coffee that goes into Rosabaya de Brazil capsules comes from small plantations in the highest regions of Colombia. The beans are hand-picked and treated with the wet method to create an intense bouquet. The wet coffee is then dried in sheets of parchment and transferred to the Paramo de Letras region. The climate here is dry and cold, helping to preserve the flavor of the beans. Flavor-wise, you’ll enjoy acidic, fruity notes with a medium body. On the nose, Rosabaya de Brazil capsules have notes of wine, redcurrants, and red fruits. 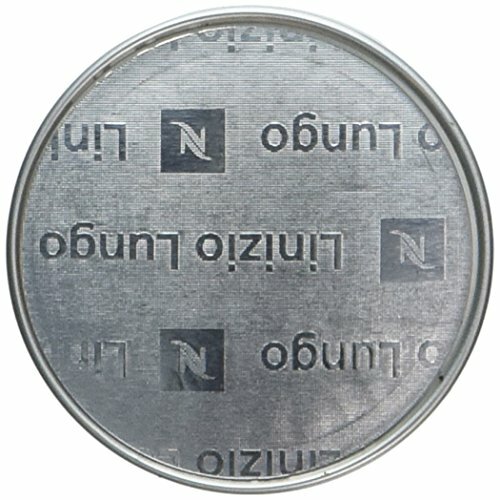 The name of these capsules gives away the origin of the coffee they contain! Arabica and Robusta beans from southern India are shade-grown on high plantations where pepper and spices are also cultivated. The result is a very pure, intense, and slightly bitter coffee. The Arabica beans are lightly roasted so that the subtle aromas are captured, while the Robusta is well-roasted to bring out its intensity and full body. The grind used is very fine to enhance the flavor of the coffee and draw out its intensity. On the nose, you’ll find dry, cocoa notes, together with spices such as nutmeg, cloves, and black pepper. Well, Nespresso has your back on that. Their three-pod Lungo collection is specially designed to cater for those who like their brew longer. 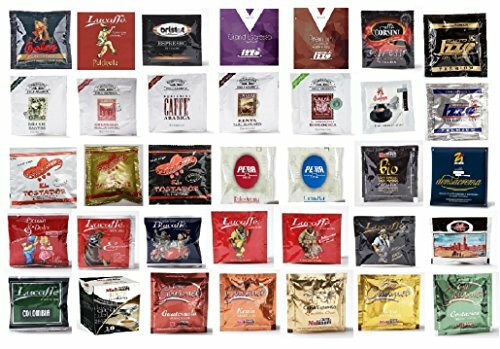 All the capsules in the Lungo collection are designed to be used with a cup capacity of 3.7 fluid ounces. Fortissimo Lungo pods are made using an elegant, balanced base of South and Central American Arabicas with a splash of Robusta that adds body and character. The split-roasting technique that’s used to create the blend reinforces the character of the coffee’s origins and further develops its body, bitterness, and intensity. Woody notes and a characteristic cereal bouquet accompany this brew. The South American Arabicas that are used to create this blended Lungo coffee are grown at high altitude, bringing with them a light acidity. Brazilian Cerrado coffee reinforces the body of this coffee and brings with it a slight bitterness, while Ethiopian Arabicas add a floral note. The different beans used in the creation of Vivalto Lungo are roasted separately, and the grind is designed to be best enjoyed in a large cup. While sipping on a Vivalto, you’ll smell sweet cereal, subtly floral, and roasted, woody notes. Linizio Lungo coffee is made from hand-picked Brazilian and Colombian Arabicas. The Brazilian Bourbon beans are washed and then de-pulped, before being left to dry in the sun, still encased in their mucilage. The Colombian beans are fermented and washed afterward. Split roasting the beans draws out each region’s specificities. Longer roasting time creates a dark bean with the malty, cereal notes of the Bourbon beans. The shorter roasting time used for the Colombian Arabica complement creates lighter beans and accentuates the softer, sugary notes that are typical of the growing region. 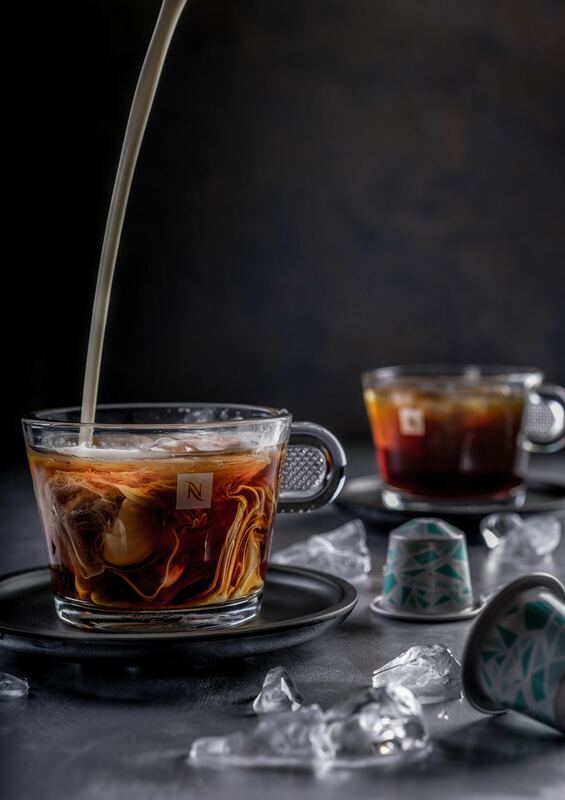 Nespresso’s Decaffeinato capsule collection is squarely aimed at coffee lovers who enjoy the flavor of coffee but don’t want the jittery buzz that caffeine can bring. Now, just because the coffee contained in Nespresso’s Decaffeinato capsules is caffeine-free, doesn’t make it low on flavor; you can still enjoy a superior-quality brew, without fearing the effects of caffeine. The coffee beans that go into making Nespresso’s Decaffeinato capsules are a blend of several Colombian and South American Arabicas with a touch of Robusta. The short, light roasting process used accentuates the refreshing and fruity character of this brew. Nespresso has adjusted the grinding process too, to produce a light, yet distinctive brew. The delicious aroma that rises to your nose in the steam from a cup of this coffee has hints of wine, butter, red and dried fruits. The Lungo capsule in the Decaffeinato collection of coffee pods is made from a blend of Colombian and Brazilian Arabicas with a small touch of Robusta. The slow roasting process brings out and enhances the coffee’s grilled notes, which are also reflected in the bouquet. Intenso (as its name suggests) is a powerful, dense flavor coffee that’s created from dark-roasted South American Arabicas and a slight touch of Robusta that works well to draw out the roasted cereal and cocoa notes of this full-bodied brew. The brew you’ll make from Intenso capsules has very intense chocolate and grilled notes that are present in the coffee and the crema. We’ve given you a comprehensive overview of Nespresso’s coffee capsule offerings, as well as some tidbits of information with which you can impress your coffee fan friends. No problem. Oh yeah, we have one last great tip for you. If you’re still not sure which of Nespresso’s range of capsule coffees will hit the spot, you have to try their Grand Sampler. 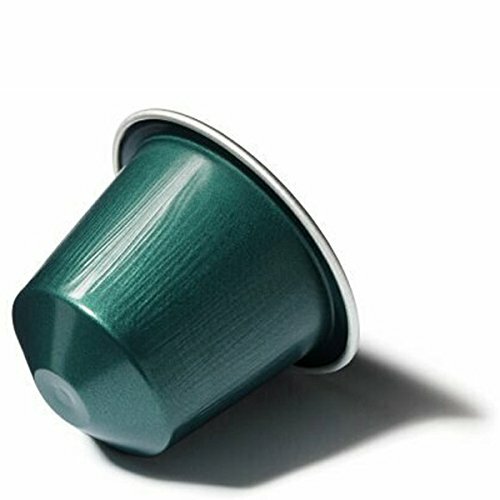 The sampler contains no fewer than 70 coffee capsules taken from right across Nespresso’s collections, and somewhere amongst the selection, you’re sure to find at least one (probably more) coffees that perfectly suit your taste.